Hi, we’re Owen Goss and Matt Rix, and together we are Milkbag Games, the two-person team making FutureGrind. 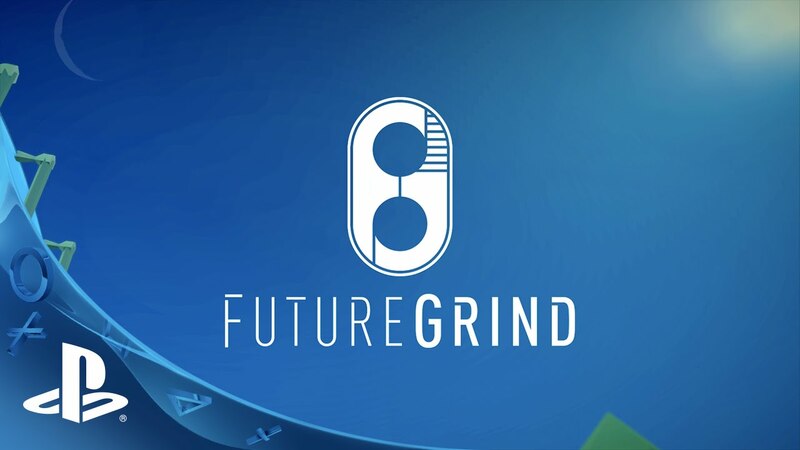 We are extremely excited to announce that FutureGrind will be coming to PS4! 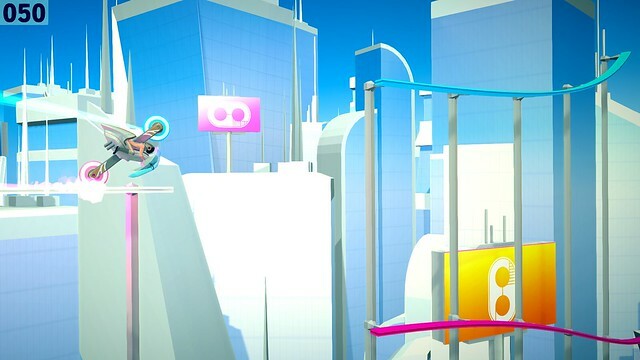 FutureGrind is a game all about skill, tricks, and speed. We think it’s a bit like Uniracers meets OlliOlli. The game is played on a track made of rails that run through a 3D environment: some rails are blue, some are red, and some are white. Be careful: do NOT let the wrong wheel touch. Your blue wheel can touch blue rails, your red wheel can touch red rails, but touch the wrong rail and you’ll cause a short circuit. Watch out, short circuiting leads to, well, a bit of a mess. Survival is important in FutureGrind, but it’s really just the baseline. In order to succeed, you’ll need to get good at doing chains of tricks. Points are awarded to you based on how you grind on the rails. Balance on top of a rail for a Manual. Boost up into the bottom of a rail for an Undergrind. Dangle from the top of a rail for a Hanger, and so on. Rack up long grinds to increase your score. Do flips in the air for big points. Transfer between rails flawlessly to build your chain multiplier. Only skilled players will earn endorsements from The Sponsors and progress through the game. Did I mention that the talented musician bignic is writing a complete, original soundtrack for FutureGrind?! Because he is, and it’s amazing. One of the songs is in the teaser video above, but if you want to hear more, head over to his Bandcamp page and check out the 4-track EP of FutureGrind music he just put up. It’s good stuff. We’re really excited to bring this game to PlayStation! We’ve made great progress on the game so far, but there’s still a lot of work to do. We’ve got a bunch of different environments planned, all with multiple tracks in them, as well as new grinders and all the bits and pieces that tie everything together into a finished game. Keep your eyes on PlayStation.Blog and the official FutureGrind site for more news about the game. We hope that you’ve enjoyed what we’ve shown today! well you can count on my money. looks great! This reminds me of Uniracers. Loved that game. Oh man that looks great, any chance it comes to Vita? Colourblindness is something we’re thinking about. We haven’t worked with the colours to make them colourblind useable yet, but it is something we’re aware of. That trailer really got me pumped for Futuregrind. Can’t wait! Oh my god, this looks so addicting! this game looks good ish. That’s right. The blue wheel can only touch blue rails, red wheel on red rails. There are also white rails that are safe for both wheels. But you can grind your wheel along a rail in a bunch of different ways for different tricks. Looks awesome. Always looking for a game I can lose myself in while listening to podcasts (currently that game is Rogue Legacy), this seems to fit nicely. I’ve also always wanted a Uniracers sequel, and this appears to be the closest we’ll come. I’m crazy excited for this game as well, but colorblindness is crippling in a game like this. Even though it may back it “less asthetically pleasing,” a colorblind option makes this game a must-have for me.